Last week, Cedric Alexander defended the Cruiserweight Title against Drew Gulak. He now has to prepare for Buddy Murphy in less than two weeks at Super Show-Down. Drake Maverick says that tonight he will mediate a face to face confrontation between Murphy and Alexander. But first, Noam Dar will take on Lio Rush. Also tonight, Mustafa Ali will finally get a rematch with Hideo Itami. Good match. It was interesting seeing Noam Dar as the bigger man in the match. It felt at times he took Rush lightly because of the size difference, and it cost him. Rush was able to avoid a lot of Dar’s offense, but Dar did still get in a lot of good strikes and holds. It seemed as if Dar might be pulling ahead late in the match when Rush hit a few devastating moves in a row to lead to the finish. I liked this match, and I’d like to see them go again. 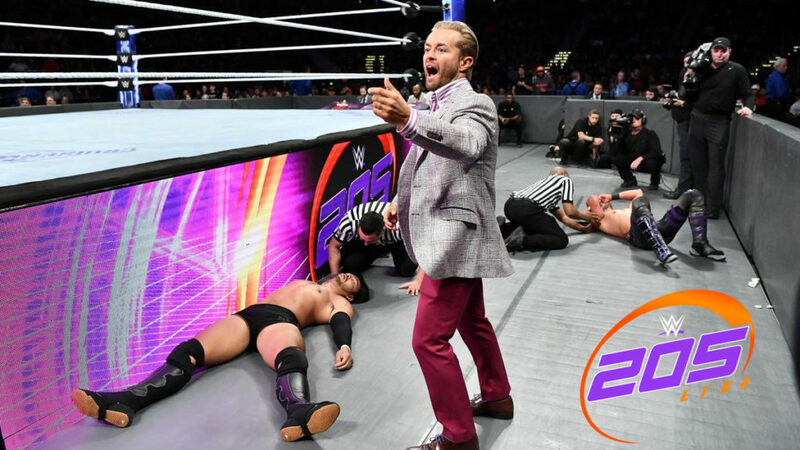 Drake Maverick sits down with Cedric Alexander and Buddy Murphy. Alexander intends to win. He’ll defeat Murphy again because of his pride. Murphy says he was so close to defeating Alexander last time, and now he’ll have the home field advantage. Murphy says he’ll beat the hell out of Alexander and take his title. Murphy finishes talking and leaves. A squash in under ten seconds. After the match, Drew Gulak attacks Cody Devine. Gulak continues the attack until Kendrick throws Devine out of the ring. Mustafa Ali says he might be insane to take on Hideo Itami again, but Ali has people that look to him for answers. That’s why Ali is a light in the dark. In a mask, TJP says he knows all about the passion and respect of lucha libre masks. He used to wrestle in Mexico, and he’s never cared about tradition or respect. Next week he will show his disrespect once again when he defeats Kalisto. Very good match. There wasn’t a winner, but I’m pretty okay with that. This match was about showing the lengths both men will go to in order to beat their opponent. Ali took a ton of punishment with Itami hitting numerous strikes and some big moves (like a spinning falcon arrow from the second rope). Ali hit some huge moves late in the match (including a nasty looking splash as both men fell from the top). The feud between Ali and Itami could contend for one of the best of the year if they keep going like this. Good show. The main event stole the show, but Rush versus Dar was highly entertaining, and seeing Kendrick squash a guy in nine seconds was certainly memorable. This was very good, and I can only hope the next match will be even better.